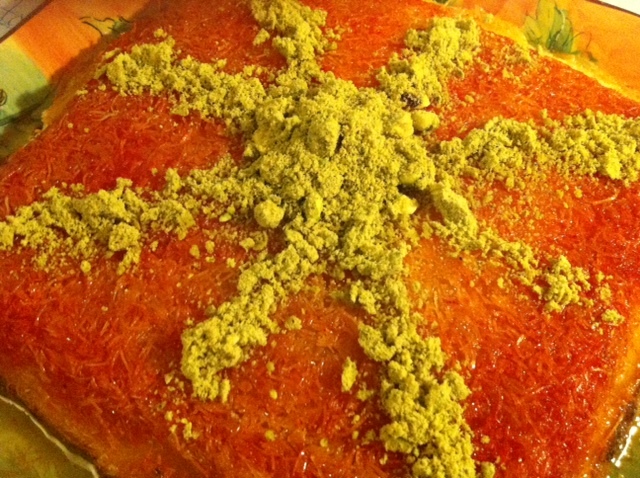 Finally got my hands on a really good Kunafa recipe that I will be settling with from now on. My friend Gada Salameh in Montgomery/Alabama gave me the recipe. May Allah reward her for every time someone makes this and enjoys it as much as I did. Yallah say the magic word, “Bismillah” and let’s start. 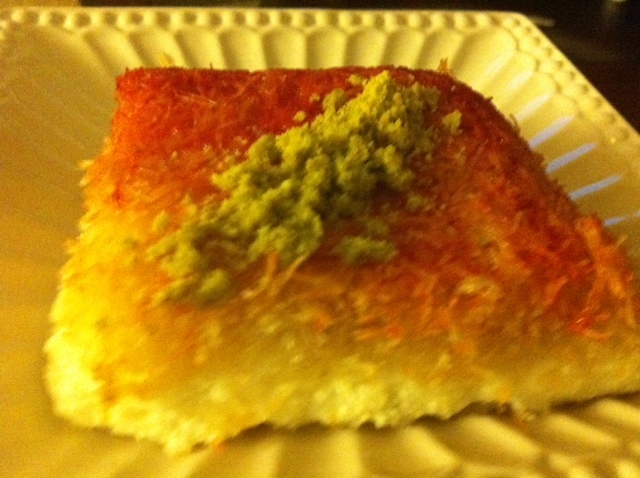 1) 1/2 packet of Kataifi [shredded fillo dough] . I have seen some regular grocery stores have it, but I usually get mine from the Middle Eastern store. 2) 4 tablespoons of softened butter. 4) 1/2 cup of ghee. I used Al Baqara Al Haloob’s brand. 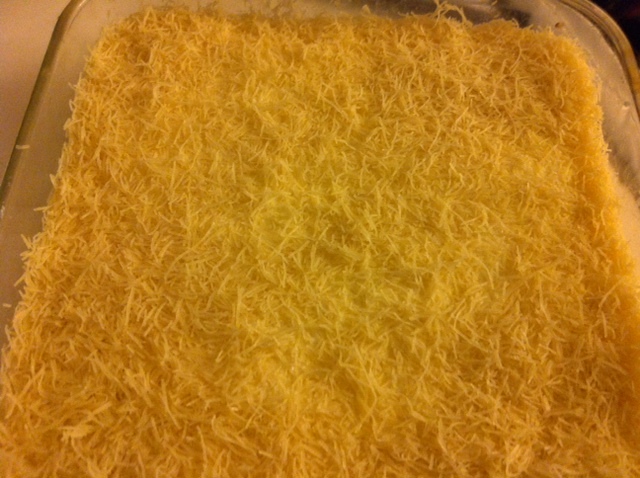 5) 3 cups of shredded Mozarella –soaked in cold water for 2 hours and drained. Place all in a saucepan and boil for 30 minutes under medium heat. Turn off and keep aside. This must be warm when you use it to pour on the Kunafa. 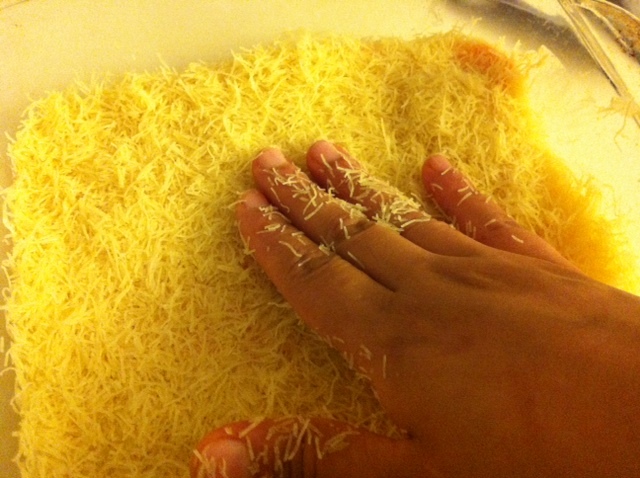 In a food processor put the Kataifi [Shredded Fillo Dough] and shred to the length of a quarter of your finger. Then mix in the warm ghee. Make sure you mix it well. 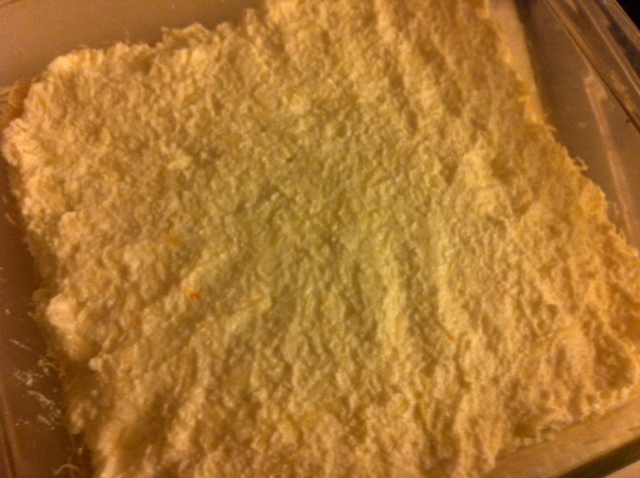 Them mix the ricotta with the mozarella, tablespoon of sugar and orange blossom water. Again mix them well. Then mix the softened butter with the orange food coloring. Now time to assemble. Before you do turn on the oven at 400 degrees Fahrenheit. 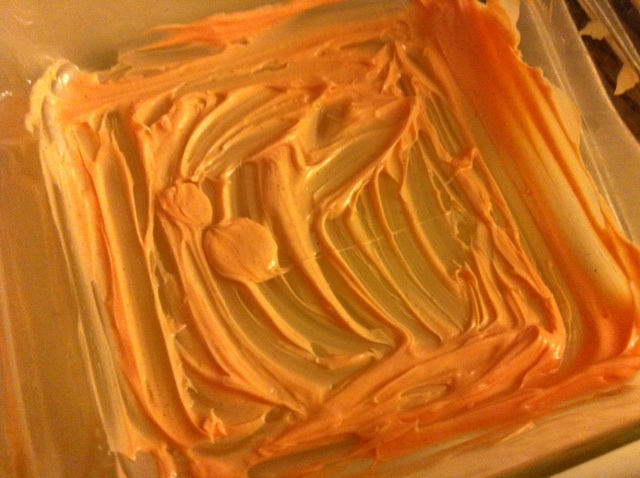 To assemble take a backing dish and first spread all the softened butter and food coloring mixture on the bottom. Spread evenly. Then take 1/3rd of the Kataifi and ghee mixture and make an even later. Pat it down and press it firmly into place. 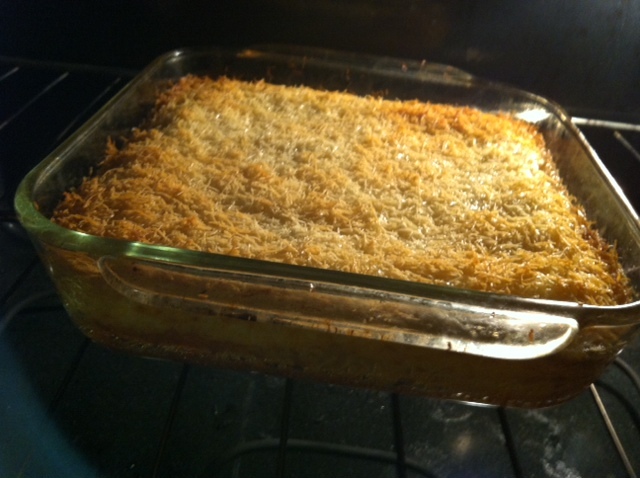 Then add the cheese mixture–avoid the ends. Then add the rest of the Kataifi , spread evenly and again press firmly into place. Now place in the oven for 20-30 minutes until browned. Take out, let it cool down a little because if you attempt to flip it it will come apart because the cheese is all gooey/soft. So, let it cool down for about 10 minutes. Then loosen the ends by running a knife gently around the sides of the Kunafa. Flip onto a plate and add as much sugar syrup as you like. Then garnish with the pistachios. Enjoy! I don’t make kunafa without cheese. So, i don’t have the recipe for it on my bog.